While a crowd of 45 watched, Jim began the creation and then each of his fellow artists and students – 15 in all – added to the ball. Here artist Josh Merritt adds some color to the ball. The result of fifteen additions to the “witch ball” was not especially artistic, but it was colorful. Glass making is difficult. Even with experienced artists, many things can go wrong. That is why the “witch ball” remains sealed, imprisoning the evil spirits until late next spring when the furnaces are shut down for the season. Then the ball is broken and the spirits can roam free. As the “witch ball” was being made, I had a chance to talk more with James Michael Kahle. 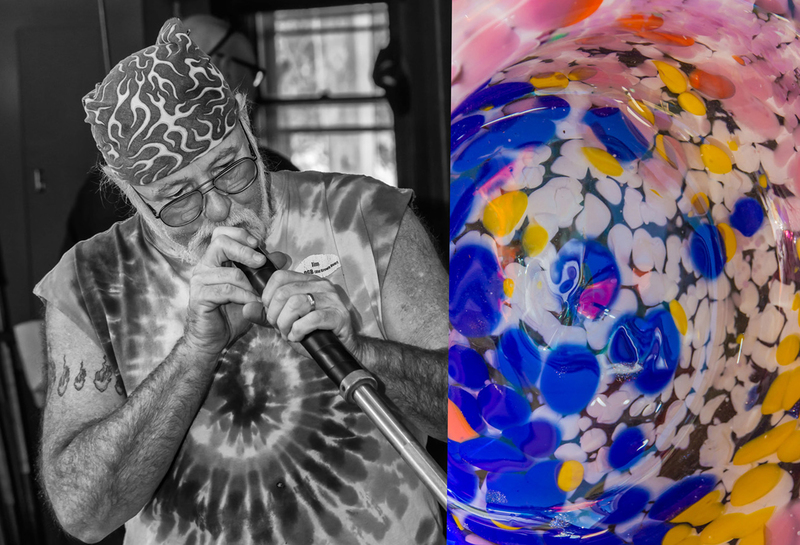 Jim is one of the region’s most respected glass blowers, but he is most proud of his role as an educator. 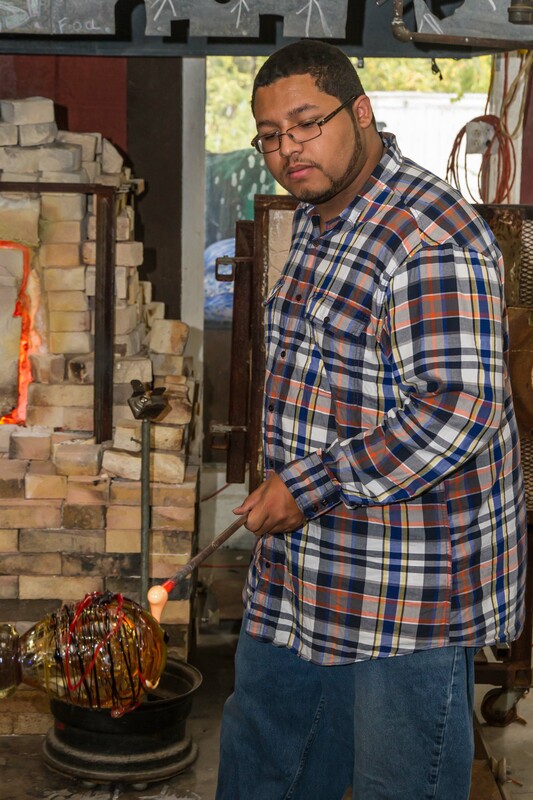 I returned to the hot shop a few weeks later. Abiona Pleasant was there making Christmas ornaments. Abiona took a break to show me around and answer my questions. She was Jim’s first apprentice when he moved to Dayton, so I asked about that training program. 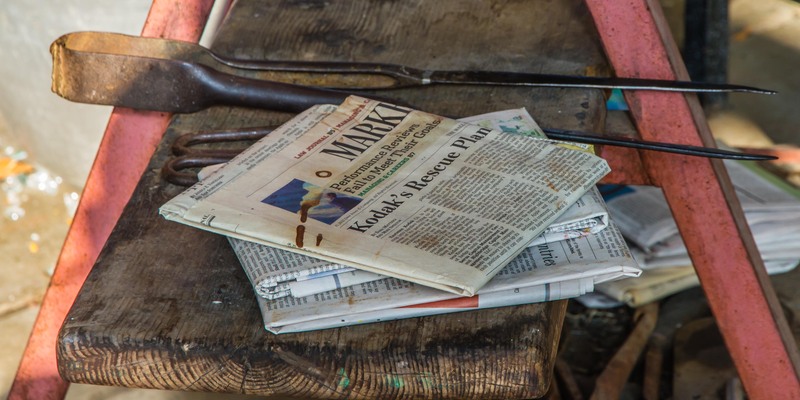 She explained that if I became an apprentice, the first thing she would hand me was a stack of Wall Street Journals. I would then learn how to fold them to make steampads that provide insulation so the glass blower can use his hands to shape the glass. They don’t use the Wall Street Journal for any political reason. They use it because the paper quality is high and because the ink is soy based and doesn’t produce harmful vapors when heated. Next Abiona walked me through the hot part of the studio. First, she explained, we need to heat the blow pipe. 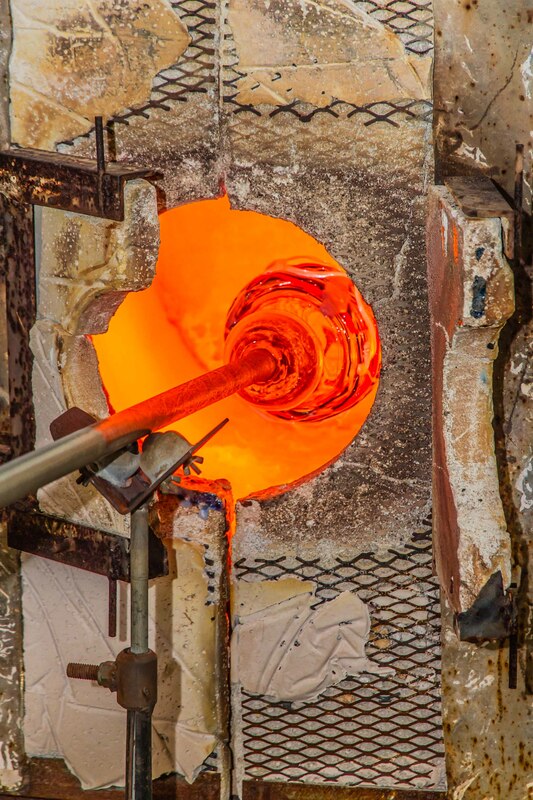 Then we dip the blow pipe into the molten glass in the large batch furnace. 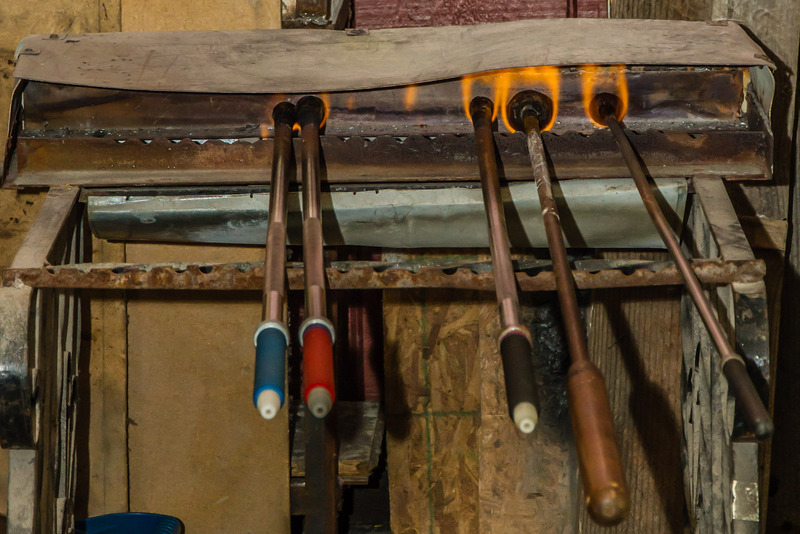 The glass that is “gathered” on the end of the blowpipe is then rolled on a thick sheet of steel before a bubble is blown into the glass. 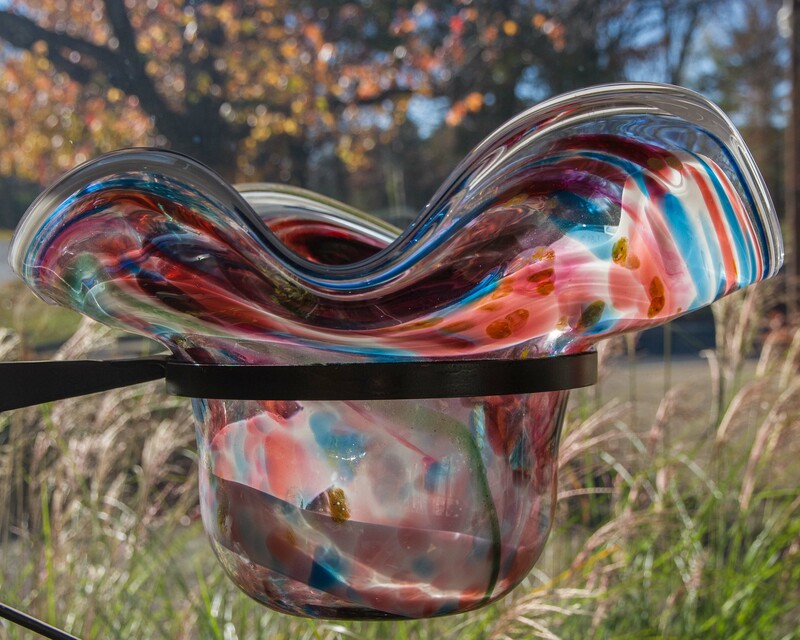 The bubble expands because of the heat of the molten glass. 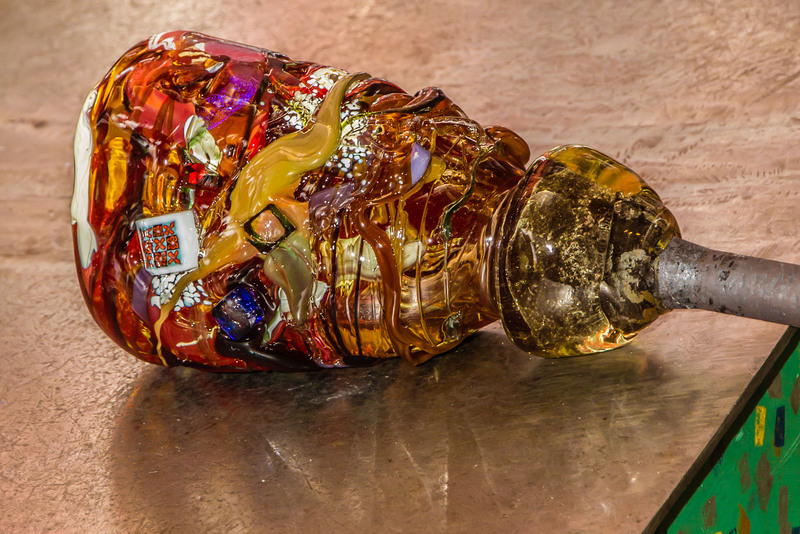 The finished glass art is placed in one of three annealing furnaces, where glass slowly cools to room temperature. 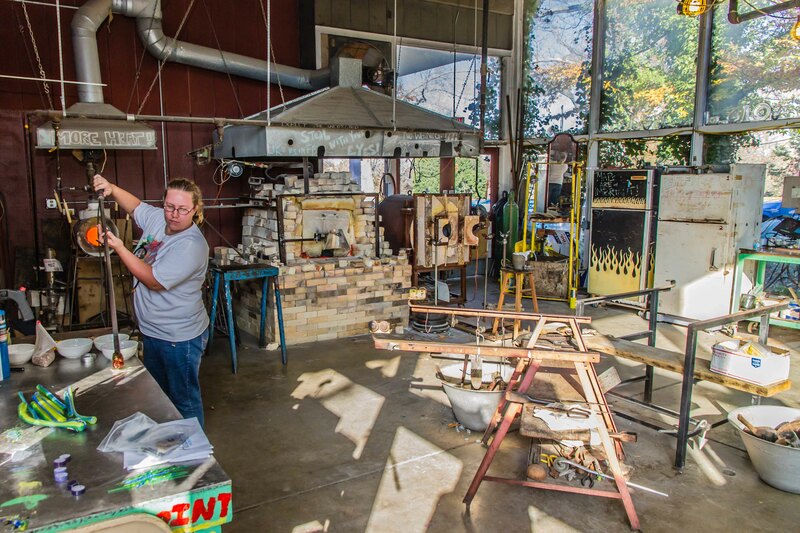 All seven of the shop’s heat sources – the pipe heater, the gathering furnace, two “glory holes” and three annealing furnaces – have been made by Jim Kahle and his apprentices. Abiona explained that this was part of Jim’s philosophy. At the temperatures they work, equipment can deteriorate quickly. Because they built the equipment they know how to fix it. Next I followed Abiona out the back door and saw about 20 blue drums. 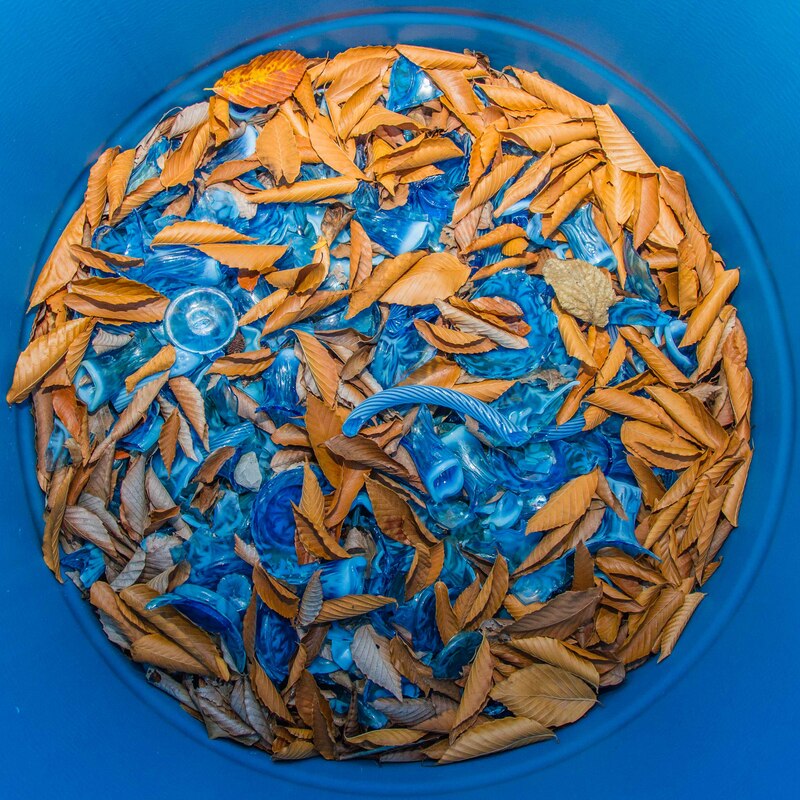 Each held a different color of cullet – broken glass – that Jim had bought at auction when a glass company went out of business. Cullet is sometimes remelted, but this cullet will be ground and then used in a large installation that is being planned out of state. The shelves seen below are filled with canes that Jim Kahle has made. 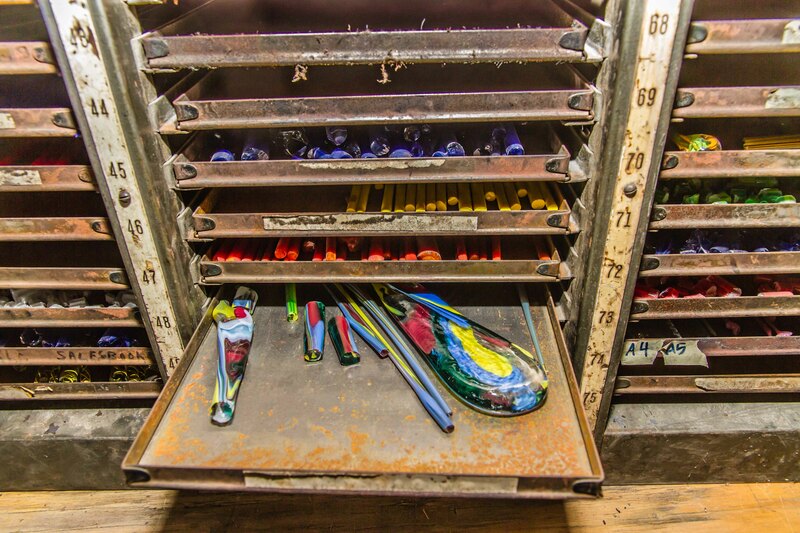 The canes will be heated and used to add color to various art pieces. Some work by Jim Kahle and his apprentices is displayed in the studio. There are many large windows, and the light brings the delicate glass art to life. It makes a nice counterpoint to the industrial equipment used to make the art. I love these glimpses of other artists working in their studios. It is inspiring to know that there are many others honing their craft in studios all over the Dayton area. What a great idea, Bill, to show the artists and the places they create in — fascinating to see how the studio environment inspires/reflects the artwork created there.